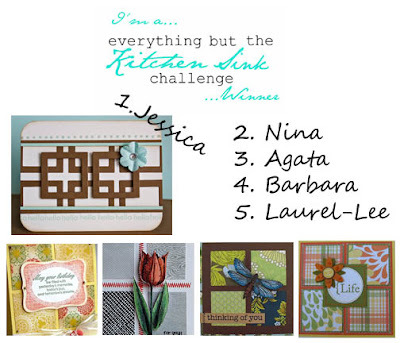 Everything but the Kitchen Sink: Everything but the Kitchen Sink Challenge #9 Winners! Everything but the Kitchen Sink Challenge #9 Winners! I wanted to thank you all so much for participating in our latest sketch challenge! It is so exciting to see so many people playing along! Here are our fine number nine winners! If you would like to see their entries, click below. Jessica, make sure you contact Courtney for your prize at courtneymbaker@gmail.com . Thank you so much for playing along! We have a fun new challenge coming up tomorrow! congrats ladies....they were ALL awesome cards!!! Now I can buy that stamp new set of Courtney's. Thanks for the wonderful inspiration ladies. Congrats to all the winners! Thanks for highlighting mine! Congrats to all. Thanks for picking my card. Congrats to everyone!! I can't believe I won!!!!! I am so excited :) Thanks for choosing my card out of so many awesome designs. Congrats to all! Great cards, ladies! A new addition to EBTKS!